Dr. Wang Lixia and Dr. Yogan Pillay have been awarded with the prestigious KNCV Tuberculosis Foundation Award for Eminence in Tuberculosis Control. 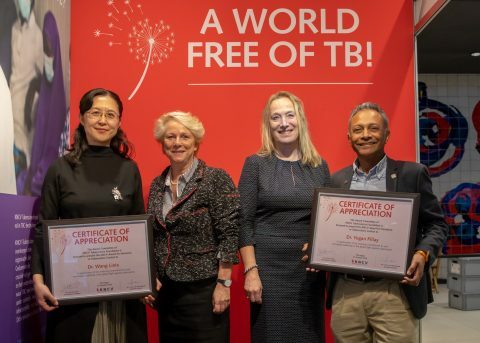 KNCV executive director Kitty van Weezenbeek presented the Dr. Karel Styblo medallion and a certificate of appreciation to Dr. Wang and Dr. Pillay at the closing ceremony of the 49th Union World Conference on Lung Health in The Hague. KNCV presents this prestigious award every five years to honor those who have provided a long-term and significant contribution to the fight against tuberculosis. For Dr. Wang Lixia, the Award Committee acknowledged her longstanding leadership in infectious disease control. She served TB control in her country for more than 15 years. Her strong drive has been an inspiration for many, both national and international, and has led to the introduction of various innovations, including the introduction of electronic recording and reporting; MDR-TB treatment programs; molecular diagnostics and active case-finding in China. In addition to Dr. Wangs national achievements, she greatly contributed to international policy development through WHO, most notably as a member of the prestigious WHO Strategic Technical Advisory Committee. KNCV is thankful to look back on a close and excellent collaboration. For Dr. Yogan Pillay the Award Committee acknowledged his longstanding leadership in infectious diseases control at the primary health care level. Dr. Pillay also served TB elimination efforts in his country for more than 15 years. His vision to tackle head-on the dual epidemics of HIV and TB by bringing together programs, services and research, is an inspiration for many, both national and international. You and your government have transformed South Africa into an eager and early adopter of innovations, both in the field of TB diagnostics and by bringing the best drugs available to the fight against all forms of the disease. In addition to his national achievements, Dr. Pillay greatly contributed to international policy development through WHO, most notably as a member of the WHO Strategic Technical Advisory Group for HIV. The closing ceremony marked the end of the 49th Union World Conference in The Hague. KNCV was the local host of the conference, which was attended by over 3500 researchers, global advocates scientists and healthcare professionals from more than 125 countries world-wide.